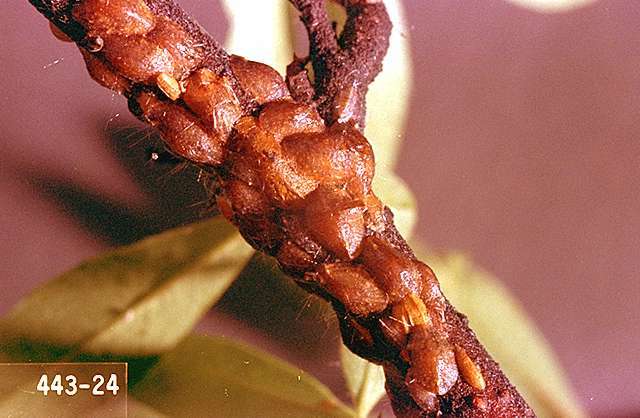 Pest description and crop damage Adult scales are up to 0.2 inch across, reddish brown and rounded, resembling small helmets or bumps on branches, stems and the underside of leaves. The crawlers are flat, oval, and pinkish brown. Scales are closely related to aphids, mealybugs, and whiteflies. Like these insects, they also have piercing-sucking mouthparts. Large populations of scale can devitalize plants and retard growth. Severe infestations can kill twigs. Large quantities of honeydew are produced that may cause russeting on fruit and growth of sooty mold fungus. Biology and life history Lecanium scale overwinters as an immature scale on twigs and branches. They resume feeding in the spring, and eggs are laid underneath the scales in May to June. The eggs remain under the scales until hatching in early summer. The young scales, called "crawlers," migrate to the undersides of leaves to feed. Young scales also can be dispersed by wind, rain, irrigation, or by the movement of people and machinery. After 4 to 6 weeks on the leaves, the young return to the stems and twigs to feed, mate, and overwinter. There is one generation per year. Pest monitoring Overwintering scales can be monitored by collecting spur samples during the dormant season. 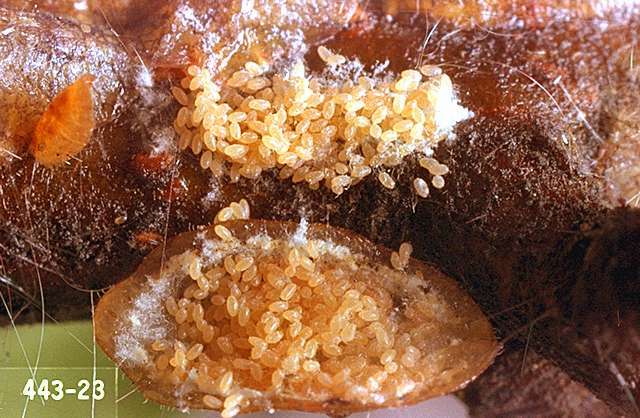 Presence of honeydew or sooty mold on fruit at harvest indicates need for pest management next season. Major infestations can be pruned off. Tanglefoot, "stickem," or a similar adhesive can be applied around infestations of adult scales to catch the crawler stage. As with aphids, avoid excessive nitrogen fertilizer or water applications, as this favors increases in the populations. In home orchards, scale can be rubbed off plants by hand with a glove or toothbrush. Parasitic wasps and lady beetles play an important role in suppressing scale insects. 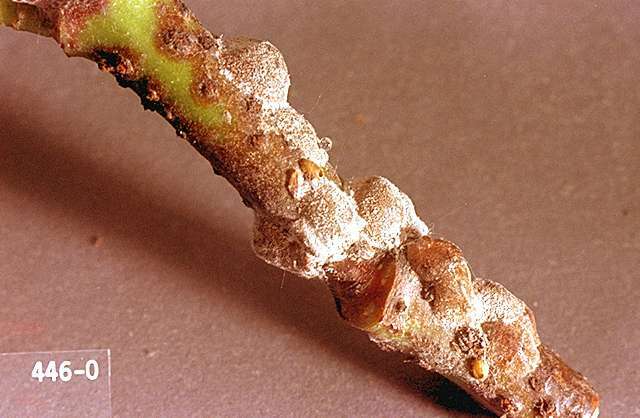 The best time to control scale insects is during the delayed-dormant period. These applications target and smother the non-motile overwintering adult and egg stages. If spring and summer scale control is required, apply during the crawler period (June). Use enough spray to cover the entire tree thoroughly including small limbs and shoots. Apply only during dormant or delayed-dormant period. diazinon (Diazinon 50W) at 4 lb/a + horticultural mineral oil (rates vary; check product label). REI 4 days. Diazinon is limited to one dormant season application per season regardless of target pest. horticultural mineral oil (rates vary; check product label)-REI varies; check product label. Horticultural oils at this timing are sufficient to control light to moderate populations of scale. Some formulations are OMRI-listed for organic use. pyriproxyfen (Esteem 35WP) at 4 to 5 oz/a + horticultural mineral oil (rates vary; check product label). REI 12 hr. Esteem is an insect growth regulator with good activity toward the scale egg stage. diazinon (Diazinon 50W) at 1 lb/100 gal water (4 lb/a). PHI 21 days. REI 4 days. Diazinon is limited to one in-season application per season regardless of target pest. pyriproxyfen (Esteem 35WP) at 4 to 5 oz/a. PHI 14 days. REI 12 hr. Esteem is an insect growth regulator.